The Bush administration has been saying in public for several months that it does not desire an independent inquiry into the gross "failures of intelligence" that left U.S. society defenseless 14 months ago. By announcing that Henry Kissinger will be chairing the inquiry that it did not want, the president has now made the same point in a different way. But the cynicism of the decision and the gross insult to democracy and to the families of the victims that it represents has to be analyzed to be believed. 2) When in office, Henry Kissinger organized massive deceptions of Congress and public opinion. The most notorious case concerned the "secret bombing" of Cambodia and Laos, and the unleashing of unconstitutional methods by Nixon and Kissinger to repress dissent from this illegal and atrocious policy. But Sen. Frank Church's commission of inquiry into the abuses of U.S. intelligence, which focused on illegal assassinations and the subversion of democratic governments overseas, was given incomplete and misleading information by Kissinger, especially on the matter of Chile. Rep. Otis Pike's parallel inquiry in the House (which brought to light Kissinger's personal role in the not-insignificant matter of the betrayal of the Iraqi Kurds, among other offenses) was thwarted by Kissinger at every turn, and its eventual findings were classified. In other words, the new "commission" will be chaired by a man with a long, proven record of concealing evidence and of lying to Congress, the press, and the public. 3) In his second career as an obfuscator and a falsifier, Kissinger appropriated the records of his time at the State Department and took them on a truck to the Rockefeller family estate in New York. He has since been successfully sued for the return of much of this public property, but meanwhile he produced, for profit, three volumes of memoirs that purported to give a full account of his tenure. In several crucial instances, such as his rendering of U.S. diplomacy with China over Vietnam, with apartheid South Africa over Angola, and with Indonesia over the invasion of East Timor (to cite only some of the most conspicuous), declassified documents have since shown him to be a bald-faced liar. Does he deserve a third try at presenting a truthful record, after being caught twice as a fabricator? And on such a grave matter as this? 4) Kissinger's "consulting" firm, Kissinger Associates, is a privately held concern that does not publish a client list and that compels its clients to sign confidentiality agreements. Nonetheless, it has been established that Kissinger's business dealings with, say, the Chinese Communist leadership have closely matched his public pronouncements on such things as the massacre of Chinese students. Given the strong ties between himself, his partners Lawrence Eagleburger and Brent Scowcroft, and the oil oligarchies of the Gulf, it must be time for at least a full disclosure of his interests in the region. This thought does not seem to have occurred to the president or to the other friends of Prince Bandar and Prince Bandar's wife, who helped in the evacuation of the Bin Laden family from American soil, without an interrogation, in the week after Sept. 11. 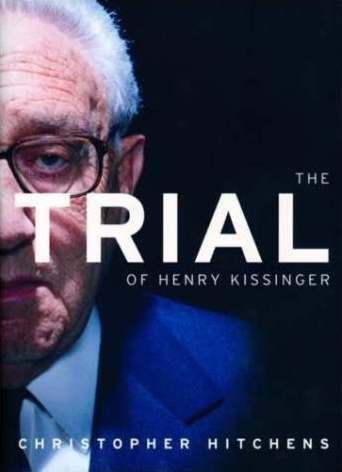 5) On Memorial Day 2001, Kissinger was visited by the police in the Ritz Hotel in Paris and handed a warrant, issued by Judge Roger LeLoire, requesting his testimony in the matter of disappeared French citizens in Pinochet's Chile. Kissinger chose to leave town rather than appear at the Palais de Justice as requested. He has since been summoned as a witness by senior magistrates in Chile and Argentina who are investigating the international terrorist network that went under the name "Operation Condor" and that conducted assassinations, kidnappings, and bombings in several countries. The most spectacular such incident occurred in rush-hour traffic in downtown Washington, D.C., in September 1976, killing a senior Chilean dissident and his American companion. Until recently, this was the worst incident of externally sponsored criminal violence conducted on American soil. The order for the attack was given by Gen. Augusto Pinochet, who has been vigorously defended from prosecution by Henry Kissinger. 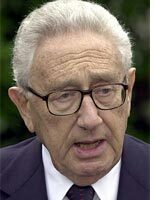 Moreover, on Sept. 10, 2001, a civil suit was filed in a Washington, D.C., federal court, charging Kissinger with murder. The suit, brought by the survivors of Gen. Rene Schneider of Chile, asserts that Kissinger gave the order for the elimination of this constitutional officer of a democratic country because he refused to endorse plans for a military coup. Every single document in the prosecution case is a U.S.-government declassified paper. And the target of this devastating lawsuit is being invited to review the shortcomings of the "intelligence community"? In late 2001, the Brazilian government canceled an invitation for Kissinger to speak in Sao Paulo because it could no longer guarantee his immunity. Earlier this year, a London court agreed to hear an application for Kissinger's imprisonment on war crimes charges while he was briefly in the United Kingdom. It is known that there are many countries to which he cannot travel at all, and it is also known that he takes legal advice before traveling anywhere. Does the Bush administration feel proud of appointing a man who is wanted in so many places, and wanted furthermore for his association with terrorism and crimes against humanity? Or does it hope to limit the scope of the inquiry to those areas where Kissinger has clients?